Egypt's Mohammed Morsi has made the first foreign visit of his presidency to Saudi Arabia, friend of the CIA and Mossad and enemy of Syria and Iran. 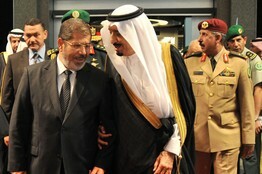 Morsi needs Saudi money to help Egypt out of its economic crisis. The Saudis have recently put $1 billion into Egypt's central bank. Egypt's foreign minister, Nabil el-Araby, has made 'tentative overtures' to Iran. But, Morsi's visit to Saudi Arabia is probably intended to send the signal that Egypt supports Saudi Arabia, rather than Iran and Syria. According to Abdel Raouf El Reedy, a former Egyptian ambassador to the USA, "Egypt is a very important pillar in Saudi Arabian security. We used to say that there was a golden triangle between Egypt, Syria and Saudi Arabia. Now without Syria, Egypt is in an even more important place." Morsi is linked to the Muslim Brotherhood, which has been used by the CIA and its friends, to topple the more liberal and nationalist Arab states, such as Tunisia. But the Muslim Brotherhood has not toppled the monarchies in Morocco and the Gulf, which are close allies of the Pentagon. Does Morsi work for the CIA?